"Enjoy our caramel pudding layered with Sea Salt Caramel Sauce in this Italian-inspired budino." Beat egg yolks in a bowl; add milk and mix well. Gradually stir into sugar mixture. Cook over medium heat, stirring constantly, until mixture thickens and boils. Boil and stir 1 minute. Remove from heat; stir in butter and vanilla. Pour into bowl; refrigerate 20 minutes. Place cookie crumbs in bottom of 6 jars or dessert bowls. 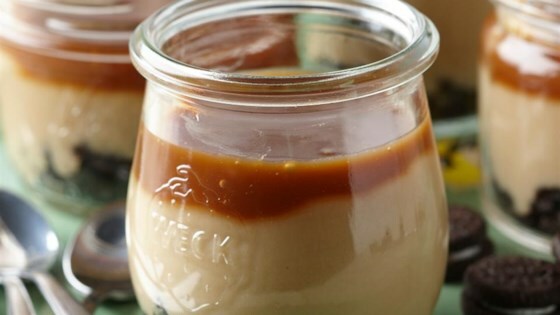 Layer pudding and Sea Salt Caramel Sauce. Top with whipped cream and a drizzle of Sea Salt Caramel Sauce. Refrigerate at least 30 minutes or until ready to serve. Recipe Tip: Recipe Tip: Make caramel sauce ahead to give it time to cool also, place cookies in a re-sealable freezer bag and crush with rolling pin or other heavy object. Excellent recipe! Very elegant on a dessert buffet. It take some time to make but is well worth it. The caramel sauce is the BEST! I decided to use plastic cups instead of jars because of the large amount of guests. I decided the jars measured up to be about 2 small plastic cups. This turned out so delicious. I used 8 oz mason jars and doubled the recipe to make 12 servings. The recipe looks more intimidating than it really is.